"CatchOn is a real game-changer in delivering actionable data and insights," said Lillian Kellogg, senior vice president at ENA. Education Networks of America® (ENA) announces that CatchOn, Inc., a software as a service tool that delivers essential data about ed tech usage, was named a winner of Tech & Learning's ISTE 2018 Best of Show Awards. This prestigious award recognizes products and services that show the greatest promise according to the country's most tech-savvy educators. Tech & Learning's panel of educator judges concluded that CatchOn exhibited the quality, effectiveness, ease of use and creativity to warrant recognition during the ISTE 2018 conference in Chicago. Founded in 2016 by Jena Draper, CatchOn provides district technology leaders with real-time evidence about application utilization, implementation fidelity, cost and return on investment. CatchOn joined the ENA family of companies in June 2018 in a move to enhance ENA's mission to support education institutions. Draper currently serves as general manager of CatchOn. "CatchOn is a real game-changer in delivering actionable data and insights," said Lillian Kellogg, senior vice president at ENA. "We are delighted to add CatchOn to our extensive portfolio of services designed to meet the unique requirements of today's school districts." "It's rewarding to see CatchOn build on its track record of success as a part of ENA," said Draper. "This honor from Tech & Learning is really a testament to the need for a tool that can quickly and efficiently help technology leaders make informed decisions about school technology use." 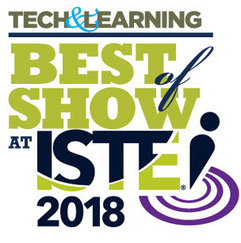 To learn more about Tech & Learning ISTE Best of Show Awards, which is in its fifth year, click here. CatchOn is an administrative tool that provides district technology leaders with real-time evidence about app use, implementation fidelity, cost and ROI. The tool collects up-to-the-minute data on every device type and all app, software and website activity, allowing districts to see 100 percent of activity on 100 percent of devices at their schools. Using evidence from CatchOn, district leaders can measure ed tech initiatives, prescribe professional development and optimize their budget for licensed and non-licensed digital learning tools. For more information about CatchOn, follow @getcatchon or visit http://www.getcatchon.com. Education Networks of America (ENA) delivers transformative technology solutions, supported by exceptional customer care, to education and library communities across the United States. Since 1996, the organization has worked with customers to design and engineer high-capacity and future-ready broadband, Wi-Fi/LAN, communication, cloud and security solutions. For more information, please visit http://www.ena.com, call 866-615-1101, or email info(at)ena.com.